As evident here and here, I'm a huge fan of The Lord of the Rings, and specifically of Samwise Gamgee. Yesterday I watched The Fellowship of the Ring, and there was one short scene that stood out to me. As Sam and Frodo are leaving the Shire, Sam stops a few steps behind Frodo. "This is it," Sam whispers. "This is what?" Frodo asks, turning around to see what Sam is talking about. Sam hesitates, then says, "If I take one more step, it'll be the farthest away from home I've ever been." Frodo smiles and says, "Come one Sam." After another pause, Sam steps forward. They continue on as though nothing happened, and Frodo asks, "Remember what Bilbo used to say?" His voice fades into Bilbo's as we hear the old hobbit's advice to Frodo. "It's a dangerous business, Frodo, going out your door. You step onto the road, and if you don't keep your feet, there's no knowing where you might be swept off to." Sam took that single step. Just one step took him farther than he'd ever been before, and that was the beginning of the journey that swept him off and changed him forever. If he had been afraid to go just one step further than before, none of it would have happened. Frodo would never have come close to Mordor, and Sam wouldn't have become the incredible hobbit he is at the end of the story. When we are faced with a new challenge that pushes us the farthest we've ever gone, we could hold back. We could say, "No, I don't want to do this. I don't want to step out of what I know." We could refuse to take that single step. But one little step was the beginning of Sam's transformation from hobbit to hero, and one step can be the beginning of our journey. We can do great things, impossible things. We can even walk into Mordor. But an incredible journey can only begin if we're willing to take one more step. Here's the first half of chapter one of The Schoolgirl, book one in my Enchantress trilogy. You can read another excerpt from later in the book here. (By the way, in the other excerpt I said that Minnie was ten. Since then I've made some changes and now she's twelve at the beginning of the book.) Let me know what you think! A cold night breeze came blowing through the tiny window high above me. The shutters were closed, but they were crooked and broken, and did next to nothing to protect us from rain, snow, wind, or whatever else might want to get in at us. The creaking sound of the door opening sounded in my ears, but the light of Mistress Mordon’s lamp did not flood the room. She must be in the next room over. With any luck she would still be a couple rooms down the hall, but still I didn’t have much time. Barely turning my head, I snuck a peek at Abigail, asleep in the bed next to mine, so close we might have been sleeping side by side. Her eyes were just closed, and her breath was gentle and still. I gently shut my eyes and tried to copy her slow, rhythmic breathing. The door creaked again, and under my eyelids I could just see the light cast by Mistress Mordon’s lamp. As her footsteps drew near, I kept my breath carefully controlled and willed her to stay away from me. The sound of her footsteps stopped right beside me, and I could feel her gaze resting on me. Imitating Abigail as closely as possible, I prayed that my breathing was natural enough. At last she moved on, and in a moment the lamplight disappeared with the sound of the door creaking shut. I lay still a few minutes longer to be sure she was gone. At last opening my eyes, I peered around the room, wanting to be certain everyone was asleep. Finally satisfied that no one would see me I silently slipped out from under the one thin sheet covering my bed and tiptoed to the wall beneath the window, where the feet of two beds met. Squeezing into the few inches between them, I climbed up to the top bunk and reached up, feeling for a tiny outcropping in the wall, a place where the bricks were not quite evenly laid. I pulled myself up, balancing on the metal railing at the foot of one bed, and stretched up for the next handhold: a spot where the mortar between the bricks had begun to wear away, leaving an opening just large enough for the tips of my fingers to hook into. Half pulling myself, half jumping, I got my feet onto the first handhold, where there was barely enough space to balance on the tips of my toes. The next step had to be done quickly or I would fall. Swiftly, with a precision developed by too many failures, I reached up for the window and swung myself up onto the narrow ledge, opening the shutters to make more space. I took a satisfying breath of fresh air, the first I’d had in days. It was terrible, being shut up in that big brick building with all those other children day and night, especially since there were only two who could qualify as friends. And Thomas couldn’t really count; he was too annoying. But here was freedom; here I could sit and think for as long as I wanted without interruption. From the window I could just reach the rooftop, which I quickly jumped up to. Here I could see the stars, beautiful, brilliant spots of light in a dark sky. Hope for a better life in a black world. Gazing up at them, I remembered that a great sorceress had died just a few days before, or so I had heard. If I was going to make a wish I’d have the best chance with a new star; they were always more willing to grant wishes right after they died. I didn’t notice anything in the sky that was different than before, but I’d never been able to keep track of the stars too well. There was one star that seemed brighter than the others, so that would have to do. I concentrated on that star as I though of my wish, something I’d longed for every time I’d managed to slip up here during our free hour, when I could watch the schoolchildren walk home, carrying books that I was sure held wondrous things. I wanted to be a schoolgirl, to spend everyday in a place where they taught you things, things beside basic reading and writing and a little arithmetic. “I wish I could go to school,” I thought hard. “Let me go somewhere I can learn. Anywhere, as long as it’s better than here.” I shoved from my mind my other wish, the one I knew could never come true. I wanted to be a sorceress. I wanted to go to the Sorcerer’s Academy and learn magic. I didn’t even know if I had magic, or what it meant to use it; to me magic was just a strange power that allowed you to fly and do other impossible things. But still I dreamed of attending the mysterious school. The wind blew harder, and, though I was used to cold, I began to shiver. My eyes drooped, and I began to nod off despite the freezing air. No! I mustn’t fall asleep there. Carefully I climbed back inside and slipped into bed. As my eyes closed, an idea entered my mind. It wasn’t really a thought of mine, but more like a whisper in my mind, like I was receiving the faintest breath of the memory of another. Whatever it was, it was strong, and refused to be ignored. Perhaps it was not enough to wish. Perhaps no wish, no matter how strong, could be granted without action. It was a strange idea to a girl who thought of magic as a means of solving problems effortlessly, but the thought persisted in my mind as I drifted to sleep. Someone was shaking me. “Minnie,” a voice called. “Minnie, wake up. Minnie!” I was shoved again, and this time I opened my eyes. “Great!” I exclaimed sarcastically, jumping out of bed and pulling off my nightgown. I yanked my faded blue dress on, and as Abigail buttoned the back with her quick fingers I hurriedly combed through my tangled hair with my not-so-quick ones. As we dashed down the hall I pulled my hair into two braids and flung them over my shoulder. “Why did you sleep in so late again?” Abigail asked. The clock in the entrance began to chime right as we ran though the dinning room doors. We joined the line of children waiting for the breakfast of porridge made by the older girls. “You were up on the roof again,” Abigail whispered with an accusing tone. “Yes, I was.” A girl handed us each a bowl as I spoke. “Minnie, stars can’t grant wishes. We both know that.” Another girl dumped a ladle-full of porridge into each of our bowls. “I think they do,” I insisted. “Right,” she said, with a tone that clearly meant that the conversation was over. “But how do I do that?” I pressed. “Just tell me,” I begged. “So how are you planning to become a teacher?” I asked. “I read those, and anything else I can get my hands on. I can’t stop hoping that maybe, someday, if I study enough, I’ll find a way.” She turned back to her porridge, clearly finished with the conversation. I started thinking about ways to get around all the problems, but my thoughts were interrupted by a voice from behind me. “What sort of things would the postman tell you that he wouldn’t want me to know?” I asked. I glanced at Mistress Mordon again. The postman had left her. A gruff voice whispered in my ear, “You’re a lucky girl, miss.” I turned and saw the postman walking away from me. “Thomas Rodman, you tell me what the postman said to you this instant!” I was whispering as loudly as I dared. “Minerva Hilden,” Mistress Mordon said. I hurried to the front of the room and took the letter from her. As I turned it over in my hands, I realized where I’d heard the name before. Samuel Truman was the head student at the Sorcerer’s Academy. But he wouldn’t be writing to me. It must be someone else by the same name. But why would anyone write to me? I didn’t know a soul outside of the orphanage. I tried to keep my hopes from rising as I broke the seal. It was a plain seal. It didn’t look like it was from a school. Slowly, I opened the letter. I gasped and dropped the letter. I picked the letter up again and looked at it again, hoping against hope that I wasn’t dreaming. I rubbed my eyes, then pinched myself, but I still wasn’t waking up. “I- I’m not lying ma’am. Would you like to see?” I held the letter out to her. She snatched it from me and began to read it. The look on her face went from annoyance, to disbelief, to furry, to wicked glee. She was smiling when she looked up from the letter, smiling in a way that told me that all was not right. It was too suspicious. With this smile on her face, she handed the letter back to me. I took it nervously. “Pack your things Minerva,” she said with a fake sweetness in her voice, “You’re leaving in the morning.” She turned back to the rest of the mail, and I hurried back to where Abigail and Thomas were waiting. “What did the letter say, Minnie?” Abigail asked. “Were you accepted?” Abigail asked. SPOILER ALERT!!!!!!!!!!!!!!!!!!!! Before reading further read this, then this. I curl into a ball, hugging my knees close to me and hoping he won’t come near me. The pain in my arm has been replaced by a throbbing ache that seems to have no intention of leaving anytime soon. Why has he brought me here? Was he actually trying to take me? Or did I really spoiled his plans to take my lover? He kneels beside me, removing the scrap of cloth tied over my mouth. “I’m not going to hurt you. Liar. I spit in his face, the only act of defiance I can muster. I mean it,” he says, as though he can’t understand why I don’t believe him. He bumps my arm and I grimace, gingerly pulling away. I see his gaze lower to my injury, and his expression changes to one of guilt. Serves the man right. Our last king was a good man, but I fear his mind grew weak in his age. No sane person would name this man successor to the throne. “That was an accident,” he says. “I didn't mean for it to happen.” Now he’s trying to excuse himself? He couldn't be a strong ruler, not if he can’t support his own actions. Not to mention the way he’s treated me. No man who would treat any woman, rebel or no, in this manner can be trusted with the ruling of our kingdom. He should have let me go when I tried to run. He can’t cover this forever, and when it comes to light every man and woman with even a shred of honor will rise to support our cause. Nothing can stop us now. “I’ll let you go if you cooperate. I promise.” He voice yanks me out of my musings. As though his promises could ever mean a thing. But as he walks away I gather enough courage to ask the question I’m dying to ask, the one thing I must know. “What do you want with me?” The sound of my own voice startles me, scratched and fearful, and certainly not the strong voice I used to rally the people. Then I’m right. I got in his way; I stopped him from taking his intended prisoner. Good. That means that my fiancé, our leader and true king, is alive. He returns to me, this time pulling my hands behind my back and tying them tightly. I close my eyes and lean against the wall. I’m finished fighting him. If he kills me, word of it will reach the others and they’ll use my death to rally the kingdom. There’s nothing else I can do now anyway. I hear his footsteps moving away from me. I lift me eyelids just enough to see him slipping away into a shadowy corner. Why is he doing that? What is he going to do? I shut my eyes again, resigned to the knowledge that there’s nothing I can do. I hear the door creak, but I don’t open my eyes. I don’t care what he does anymore. And there’s no point in trying to run anymore; I could never get out of this cave without being caught. Suddenly I feel one of the strong, beautiful hands I know so well stroke my cheek while the other pulls me close. The first thing I see when I open my eyes is that pair of loving eyes, clear and blue, reflecting the dim light of the torch on the wall. My lover, my rebel, my hero, my king has come to rescue me. A thousand thoughts rush through my mind in an instant, but only one forms into words. “You shouldn't have come. Then I see it: the twisted, evil knife held high by my kidnapper. “You don’t know what you’re saying.” My hero’s words barely register in my mind. Now I understand it all: I am not the one he wants; I’m the bait. But he won’t take my lover, not while I’m living. My hero leans over me, and I can see in his eyes what even he is not yet aware of: he’s going to kiss me. He doesn't even know how desperate he is for our lips to meet, for that reassurance that it’s going to be ok. But I can’t give it to him to him. I won’t kiss him, won’t stand beside him. I won’t be his fellow rebel leader. I won’t be his queen. There’s only one thing I can give my brave warrior now. Steel soars through the air as I kick him away from me: my one last act of defiance. This is my ultimate rebellion: to die, to take the attack meant for the man who must live. In an instant I see the horror, anger, and pain in the eyes of both men in the room. Then the pain in my side registers in my mind. I feel the poison on the blade enter my blood, and I no longer have even the strength to scream. This is the third version of the scene I wrote, this time (obviously) from the POV of the girl. I don't like this one nearly as much as the other two, but once I wrote it I had to post it to complete the trio. I wrote this mainly because I had to know what she was thinking while it was going on. SPOILER WARNING!!! Before reading this, go here to read this other post I wrote. Once you've read that you can go on. As an answer she spit in my face. As I walked away from her I heard her quiet voice for the first time since we arrived. “What do you want with me?” Her voice was broken, and I finally sensed her shattered spirit. How had I come so far, to do this to a lady? I closed my eyes briefly, trying to block out the guilt, before looking back at her. “I want nothing with you but to have you off my hands. You weren't a part of my plan.” She’d been in the way, and I had adapted accordingly. But she wasn't the one I wanted. It was time. He would be here soon if all went according to the plan I’d so carefully laid. I knelt beside her once more, this time to bind her hands behind her back. She did not struggle now, yet it was clear that her unwilling compliance was not the cooperation I had asked for. Was she really so broken? What had happened to the fighter I’d kidnapped? Where had that girl gone? She closed her eyes as I leaned her against the wall. The light cast by the one torch was limited, allowing me to hide. Pressing myself into the shadows, I placed my hand on my knife, waiting for the perfect moment. The door creaked as he slipped in, thinking himself unseen. The fool. He was by her in an instant, pulling her close and caressing her cheek, the same way father used to caress mother. He inherited too much of father: his charm, the way he spoke to the people, it was no wonder they followed him. But he didn't inherit the kingdom, and that would never be his. Her eyes opened, staring into his. “You shouldn't have come,” she whispered. My fist tightened around the handle of my knife. Would she warn him? He ignored her remark, instead untying her hands. “It’s ok. You’re going to be alright.” She would, but not him. “No, leave me,” she pleaded. “Leave now while you still can.” Still he disregarded her warning, but I could not take the chance of waiting any longer. Silently, I pulled my knife from my belt. That was when her eyes met mine. “You don’t know what you’re saying,” he said. But she did, and as she saw the knife raised in the air her eyes filled with a mixture of realization, fear, horror, and determination. Too late to pull back, I saw her warrior spirit resurface, and as the knife flew toward them she kicked him away, calling up every ounce of strength left in her body. As he fell back the twisted blade hit, not its intended mark, but her already fragile body, shattering what I was sure was the last of her life. I thought of this scene a while ago, and I decided to write it down. I'm starting to get a few ideas for the story behind it, but I'm not sure if it will really go anywhere. I'll probably end up using it for something sometime though. Let me know what you think! He emerged from the woods with caution. Here was his warrior princess: the brave girl who had fought beside him; the beautiful maiden taken in battle. For four long months he had searched, tracking her with every skill he had. And now he was here outside the cave that was, if the clues he followed were not false, the prison of his bride-to-be. Gently, he lowered himself through the hole in the ground, and with careful step he followed the passage he found just beneath the earth's surface. The further he moved from the hole, the darker it became. Not wanting to light a torch for fear of drawing attention to himself, he stepped forward slowly, feeling the air in front of him in case of danger ahead. The air was cold and still, and he wished for a cross breeze. At last his fingertips touched wood, and he felt about for some kind of door handle. He grasped the cold metal knob he found, and the door swung open. There she lay in the shadows, propped up against the wall, her hair matted and tangled, her hands bound behind her back, her dress torn, her arm encrusted in dried blood. Dashing to her side he gathered her broken form in his arms. Her eyes fluttered open, and she whispered, "You shouldn't have come." He began to untie her hands. "It's ok. You're going to be alright." "No!" she cried weakly. "Leave me. Leave now while you still can." She tried to pull away from him, but injured as she was it did no good. "You don't know what you're saying." He bent over her to lift her in his arms. Something struck him, and he fell against the wall, propelled backward by her kick. He staggered, gasping for breath, and for the first time noticed a shadowy form in the corner. Gradually, he came to understand as he saw the weapon, a blade he knew too well. Its handle was black and twisted as the heart of the man who threw it. The bit of steel he could see glinted in the low light of the single torch on the wall, and he remembered the pain of that jagged blade. All this ran through his mind as he stared, in unbelieving horror, at the knife lodged in her side. The knife that was meant for him. Here's an excerpt from The Schoolgirl, the first book in my Enchantress trilogy. It's about Minnie Hilden, a ten-year-old girl attending the Sorcerer's Academy of the kingdom of Middon. One morning near the end of Summer I woke when it was still dark. I lay in bed trying to fall asleep again for some time before I finally sat up. I slipped my feet into my warm slippers and pulled my robe around my nightgown and peeked through the curtains over the window by my bed. The moon had set, but it was still very dark outside. I picked up the clay Samuel had given me and quietly slipped out of the room and down the stairs into the main room of our dorm. Sitting before the fire, I practiced shaping while letting my mind wander to the many things I could do once I mastered this technique. “The twenty-seventh day on the month of the Sun,” I muttered to myself. Suddenly it dawned on me. “That’s today!” I said aloud. I ran to the window and saw the sun just peeking over the horizon. I raced up to my room and changed in a hurry. As I dressed, Molly opened her eyes. I dashed back down to the main room in my dormitory and out into the freezing halls. I didn't expect to be so cold in the summer, and my mind immediately raced back to the warm boots at the bottom of my trunk of clothing. I almost turned back for them, but I was already late. The cold forced me to run to keep warm, so I reached the north wing quickly. I began climbing the cold stone steps, and at once I wanted to stay on the carpeted halls on the main floor. At least the rugs had kept some of the cold from leaking through my thin shoes. Now there was no extra layer between my thinly clad feet and the hard, cold stone. Slowly I climbed three flights of stairs. I hadn't been in this wing of the building often, and the stairs were much steeper than in the rest of the building. I had to lift my short legs high to take even one step. Panting from the long climb, I finally reached the third floor and began to make my way down the single, long hallway. Every so often I would find other halls stemming from this main hallway. I looked down at the letter I still held. The last room on the fourth hall, I read. I looked back over my shoulder to count the halls I had passed. In the dim light of the torches on the wall I could barely see the stairwell I had emerged from. How many halls were there? Two? Was there another one? I strained my eyes to see, not wanting to walk back through the dark hall. Yes, there were two. So I still had further to go. But at least there were carpets on the floor. Timidly I continued on through the darkness. I passed another hall. I was going to the next one. The light from the torches on the walls barely reached a few feet, so there were long stretches of total darkness. I finally reached the fourth hall. The hallway I was in continued further, and I glanced around warily before turning. I stood right below one of the few torches to check the letter again. The last room, it said. There were doors on this hall. They were all of the same dark wood. I slid my hand down one and felt how smooth it was. But it seemed smooth in the wrong way, not as though it was well worn, but like it was forgotten. It was the smoothness of something that had been formed to perfection and then abandoned. I felt something haunting in this hall; something more than the uncanny way the other hall had been empty. I told myself that few people were up this early, so it made sense that no one would be there, but it still didn't feel right. There was a reason that this part of the building was empty, and it wasn't the early hour. That, I was certain of. After a while there were no more doors, but the hall went on into the darkness. I glanced around for a moment before going on. There could be another room further down the hall. A few steps farther I saw a dark spot on the wall. I looked back over my shoulder, wanting to run. Was that blood? Biting my lip, I forced myself to take another step, then another. I reached the end of the hall without seeing another room. Here the hall turned into a new hall, but I didn't go down it. I turned to go back down the hall I had come from to find the last door and stopped in my tracks. There was a wooden door in the stone wall. Not a smooth door like the ones I had seen before, but a door made of gnarled, beaten wood. It was old and battered, but it was certainly the last door on that hallway. Why hadn't I seen it before? Softly, I rapped twice on the door, but I was met with a booming sound. I jumped away, frightened by the noise that had come from my small hand. Then I heard a voice, quiet and old, but not quite gentle. “Come in,” it said. I reached for the doorknob, but the door swung open before I could touch it. Slowly, I walked into the room and looked around. It had a large desk with a wooden chair behind it and the walls were lined with shelves full of books. It looked like an ordinary office. But where was everyone? I wasn't the only one who had been invited to the meeting. I heard a slam as the door swung shut behind me. Filling with dread, I slowly turned to see Head Professor Hurtain standing between me and the door. “Miss Hilden,” he said, “How nice to see you.” His voice was harsh and raspy, and I took a step back. I swallowed hard. “No,” I croaked. I shook my head, but my tears gave me away too easily and he laughed again, stepping closer, but this time there was nowhere for me to run. I stared into his eyes, captivated by fear. I could smell his breath, so disgusting I thought the scent alone would kill me. I searched the room with my eyes for some chance of escape, but there was not even space for me to duck under his arm or between his legs to run. I didn't know what he was going to do, but I could sense that his plans were terrible. “So, Minerva,” he growled, “Any last words?” An evil smile spread across his face as the impact of his words hit me. I would die there. I was going to die. My tears flowed with even more force as I realized that my short life was about to end. What would he do to me? What was it like? Did it hurt? He began moving his hands in a strange manner. It looked as though he was doing some sort of shaping, though nothing like what Samuel had shown me. But what did that matter? It would kill me, whatever he was doing. I felt an evil power seizing me and tightening around me. Invisible bands of power were squeezing me, forcing me inside myself. Then I felt power shooting inside me. As the bands pulled in, the power inside forced itself outward, tearing me apart, and I felt as though I was exploding. My vision clouded, and for a moment I could barely breathe. My head rang, and what I could see of the room spun around me. My knees were so weak I could barely stand. Then I fell to the floor, and everything went black. Classic Plot? Classic Characters? Classic What? I recently saw this picture online. 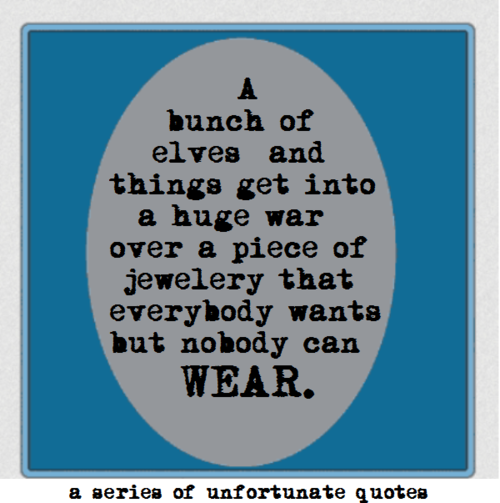 (It's a one-sentence summary of The Lord of the Rings, in case you weren't sure, and it is supposed to be goofy). Reading this made me think. I guess if you want to get down to the bare bones of the plot, that is an accurate summary. 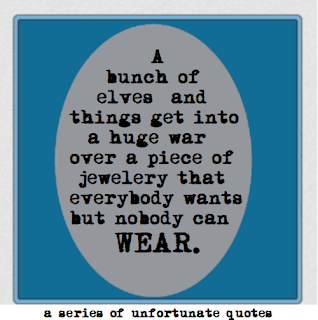 But obviously the Lord of the Rings is about so much more than that. It's about courage and cowardice and fear, learning to change your past, going on and trying again when the way seems blocked, and never giving up, no matter how hard it may be. It's about loyalty, friendship, and love. It's about learning to always make the right choices. It's about resisting temptation even when you think it may kill you. It's about taking what comes and doing the best you can. It's about service and it's about sacrifice. But a simple plot summary can never explain this. This started me thinking about other classic works. One that came to mind is Les Miserables. This is my favorite musical ever (and now it's also my favorite movie) and I'm reading the book. It's an incredible story that can teach us so much. But if you look at the most basic elements of the plot (and the plot is not necessarily what it's really about) then it doesn't look quite so nice. A thief breaks his parole and spends the rest of his life hiding and running from the police while raising the orphaned daughter of a prostitute. Throw in a rebellion and a bunch of college boys dying and you've got the whole plot. That sure sounds pleasant. Not. But Les Mis isn't about that at all. It's about many of the things listed above in my description of the Lord of the Rings, and more. It's about consequences, and how they must be faced. It's about humility and pride, and what each will bring you. It's about repentance and forgiveness. It's about faith. It's about love. It's about how to find God. These are true classics, ones that can teach you something new every time you read them. But what is it that makes them that way? Surely it's not the basic plot line. Yes, the plot summaries above are a little too simplified, but still. What makes a story about a couple of nobodies destroying a possessed ring so incredible? What can we really learn from thieves and prostitutes? But maybe the plot really has very little to do with the reason these books are classic. The plot can be a start, but really, are any of the things these stories teach that I listed above actually a main part of the plot? Aragorn: If there's one character in the Lord of the Rings that I love almost as much as Sam, it would have to be Aragorn. When I think of a truly great leader, warrior or captain (besides George Washington and Captain Moroni), I think of him. He was born to be a king, but he was ever humble. He didn't push to be the commander. When he gave advice to Theodin, the king of Rohan, and his advice was ignored, he followed the king anyway and fought to save the kingdom, even though he knew they were fighting a losing battle. He was the one who fought alongside the ordinary soldiers. He was the one who called for retreat and yet continued fighting with all his might to allow the others a chance to escape. I watch the battle in the movie of The Two Towers, and I see two different kings. There is Theodin of Rohan who commands from a distance, relatively safe behind the walls of the fortress. And then there is Aragorn, who fights alongside the ones he leads. His fearlessness inspires courage in the men, and they know he will not desert them. And later, when two men are needed to guard a narrow bridge, fighting off hoards of attackers while risking falling off the edge themselves, he is the first to volunteer. And he doesn't just show that leadership in battle. While watching The Fellowship of the Ring, the expression on his face when Gandalf dies really stood out to me. Everyone had that look of horror and grief, but the look on his face was different. It was a kind of desperation, as though he knew that he was now responsible for the well-being of his companions. And he accepted that responsibility without complaint. His dedication to fulfilling his duty is so inspirational to me. Boromir: The first time I watched The Fellowship of the Ring I hated Boromir. If you asked me what I could learn from him, the only thing I would have thought of was "what not to be like" (which isn't always necessarily bad; there are characters who really can't teach you much other than that). But I mean, really, what is there to like about him? From the beginning he's just so suspicious, and the way he doesn't really respect Aragorn drove me nuts. Not to mention his constant coveting of the ring. And the way he talked about Gondor as though he were the one true representative of the kingdom, and the only one who could represent it properly. But watching it recently, I actually really liked him. Yes, he was proud. Yes, he feared that Aragorn would take the kingdom his family had protected for generations. Yes, he was the one most susceptible to the power of the ring. But aren't we all like that? Boromir was a flawed human being, far more like us than the near perfect characters we love. He was afraid. He was proud. And he made the mistake of acting on his fear and pride. He was tempted, and he was not always able to resist. But he did try, and he regretted the things he did wrong, and he tried to fix them. And in the end, immediately after trying to take the ring from Frodo by force, he gave his life to protect the ring-bearer and his companions. Even as he was dying, he fought on to ensure the safety of the hobbits he had sworn to protect. It's true that Boromir is in no way my favorite character, but it is his flaws, his struggles, and his failings that make him so much like the rest of us. And despite his flaws, he is still a worthy role model for us to follow. He made mistakes and he repented. And he gave his life to repair the wrongs he had done. So while there are other, far better characters for us to emulate, it is often the people most like us who teach us the most. And classics are things we can learn from again and again. I believe that Boromir is a truly classic character who can teach us so, so much. For the characters from Les Mis, I want to compare some of them, and specifically their choices and the consequences they faced. Jean Valjean vs. Fantine: (This one is something my mom pointed out to me a while ago.) When Valjean was released from prison he couldn't find any work to support himself. He was starving, and he was desperate. He was told to go to the Bishop for help, and he swallowed his pride and did as he was told. And taking that advice and going to the Bishop for help changed his life. He stole the Bishop's silver and was forgiven, and he turned his life around. When he swallowed his pride and asked for help he was given the chance to have a whole new life. When Fantine was fired she was advised to go to the mayor (Valjean) for help. But because of her pride she refused. Instead she turned to the people on the streets, selling her jewelry, her hair, her teeth, and eventually herself. Her pride destroyed her life, and though Valjean found her eventually, by then it was too late to save her life. What if she had gone to him sooner? He would have taken care of her and her child, and they could have had a good life together. Both Valjean and Fantine had done wrong. Both were told to go to a person who could help them. Both were proud and did not want to go, but one humbled himself and asked for help and the other ran from the one who would aid her. Their decisions changed not only their lives, but the lives of others, for once Valjean had turned his life around he was able to serve so many others, but because Fantine did not go to him for help both her life and Cosette's were worse. Jean Valjean vs. Javert: One man wrongs another and is brought into the power of the one he harmed. He knows that he will be punished, that his life will be taken from him. And then the one he owes does something so strange, he believes he will never understand. The man lets him go. He forgives him, and the sinner is left to wonder, what has happened? How can a man forgive one who has done him so much wrong? How can this be right? Valjean and Javert were both that man. The first time it was Valjean who stole the Bishop's silver and was forgiven. The second time it was Javier who was placed in Valjean's hands and was freed. Each was in exactly the same situation, yet each made such a different choice after being forgiven. I really love that in the musical "What have I done?" and "Javert's Suicide" have the exact same music, because it really highlights how similar their situations were. Valjean questions, "What have I done?...Have I fallen so far...that nothing remains but the cry of my hate?" He argues, "My life was a war that could never be won. They...murdered Valjean when they chained me and left me for dead just for stealing a mouthful of bread!" Javert asks, "Who is this man...to have me caught in a trap and choose to let me go free?...Vengeance was his, and he gave me back my life." And here is where you truly see how similar and yet how different these two characters are. Valjean wonders about the Bishop, "Yet why did I allow this man to touch my soul and teach me love? He treated me like any other. He gave me his trust, he called me brother. My life he claims for God above. Can such things be?" He recognizes, "One word from him and I'd be back beneath the lash, upon the rack. Instead he offers me my freedom. I feel my shame inside me like a knife! He told me that I have a soul. How does he know? What spirit comes to move my life? Is there another way to go?" Javert declares, "I'll spit his pity right back in his face," and asks himself, "How can I now allow this man to hold dominion over me? This desperate man whom I have hunted. He gave me my life. He gave me freedom....Can this man be believed? Shall his sins be forgiven? Shall his crimes be reprieved?...Is he from heaven or from hell? And does he know that granting me my life today, this man has killed me even so." Each man then says, "I am reaching, but I fall." They both speak of the void they see in their lives. Each decides he must escape from the world of Jean Valjean, but Valjean does this by changing his life for good, while Javert escapes by ending his life. Perhaps here is one of the major differences between these two men. Valjean struggles to allow the power of the atonement to work in his life, wondering how he could possible be worthy of such a miraculous gift. But Javert cannot bring himself to feel the humility necessary for the atonement to heal us. His struggle is not how he can be forgiven, but how a sinner can repent and how he could even need repentance. And how he could live in debt. He will not accept mercy, and that is what destroys his life in the end. Not his sins, not his misunderstanding of God's grace, but his pride. Perhaps it is his pride that keeps him from understanding the atonement. He is so wrapped up in justice that he will not see mercy, for himself or another, and he is so proud that he believes he does not need mercy. He does not see himself as "fallen from grace" like Valjean. He does not see that we are all fallen human beings; his pride, his greatest weakness, is what keeps him from seeing how much help he truly needs. When Valjean is faced with confusion as to why God would save him, he dedicates his life to God and turns his entire world around. Javert can not see how he is wrong, and so instead of changing his life he ends it. I find is so sad that one who wanted to do what was right, who wanted to serve God, became so caught up in his pride that when he was shown another way he ended his own life because he could not reconcile his pride with the mercy he saw. And I find it so beautiful that Valjean was able to turn his horrible, twisted life completely in the other direction and devote it to serving others. By humbling himself and allowing the atonement to work in his life he not only allowed himself to be healed, but he placed himself in a position where he could heal others and guide them to God. Javert's story is so heartbreaking and Valjean's so healing. These two men show how your choices can have such a huge effect on your life, and how the consequences of a choice are never truly dictated by your circumstances. There is so much that makes a story a true classic, but I believe that the characters, the choices they make, and the consequences of those choices are some of the biggest things. These are "the stories that really matter," the ones we can always learn more from. They teach us that "small hands" "move the wheels of the world" and the "even the darkest night will end and the sun will rise." They teach us that "not all those who wander are lost," and that "a new day will come, and when the sun shines it will shine out the clearer." They teach us "that there's some good in this world, and it's worth fighting for." And they teach us that the best way to fight for that good is through love, for "to love another person is to see the face of God." These are the stories I love. Hi! I'm Emma. I'm 16 years old, and I'm a knitter and writer. I love to write fantasy and poetry, and I'm currently working on a fantasy trilogy. I've been knitting for over 7 years now, and I've started designing my own patterns. Last year I finished my first successful designing project: my very own knitted nativity. Want a knitted something? Email me! Email me to order one!